As I am slowly adjusting my diet to include mainly lean meats & fish (no wheat, NO DIARY!!!! :(...), I am experimenting with different recipes, and will share the ones that are successful. 3. The rest of my family should like it too, as I am too busy to cook us separate meals. Rinse 1.5 to 2lb of cod filets, and lay them in a buttered, 9x13 baking dish. Cover with salsa. You can go mild or spicy, pineapple, chipotle....the possibilities are endless!! I used Roasted Garlic Salsa. Top with cheese of your choice, I used cheddar...to give it some zing. Left it off on one side for me..
Bake for 15-20 minutes, until fish is opaque. Serve with rice & salad. Voila! It really couldn't be much easier :)...like waving a wand. It smelled so delicious, I could not even get a picture. The family was famished, and got their plates while I was out looking for my camera :)...so please enjoy the picture of the Cod before it becomes filet. 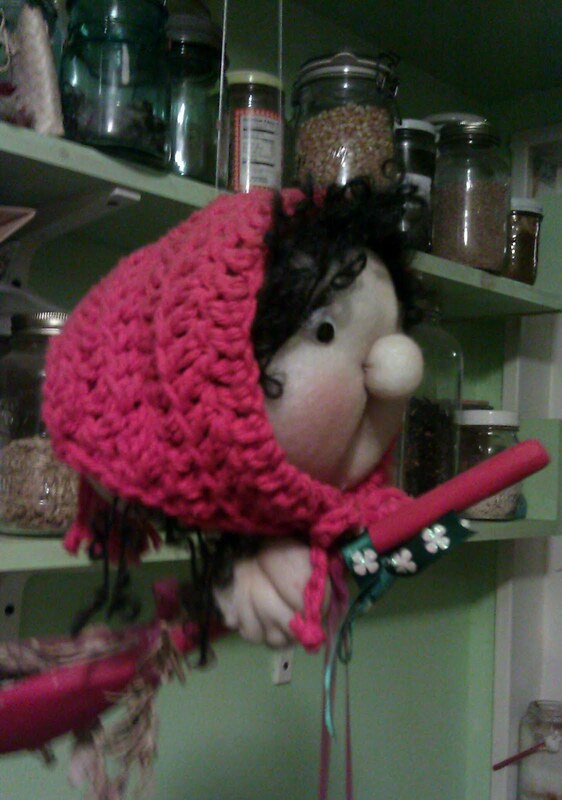 Meet Delphine, my residing Kitchen Witch :). A few weeks ago, I made bread dough to rise over night, and in the morning it was soft & spongy, way too gooey to handle. I almost threw it in the trash....but instead Delphine gave me a tip: "Put your cast iron pot in the hot oven and just plop it in. See what happens!" And so I did :)....and now I have the perfect, QUICK, recipe to share with you. I believe I was making a "5 minute bread recipe"...it may be a combination of a few tested recipes. A few easy steps, and you will have a fabulous, European style bread. I make the dough at night (takes me about 3 minutes), and let it rise overnight. In a large bowl (I use the mixing bowl from my KitchenAide), mix the ingredients. Your dough should be wet, not dry. You are not going to knead this bread, you basically just stir enough to get everything mixed up. Cover your bowl with a plastic top or something that will let a little air in. I use a plastic lid from a Tupper plate :). Let is sit overnight or at least 12 hours. 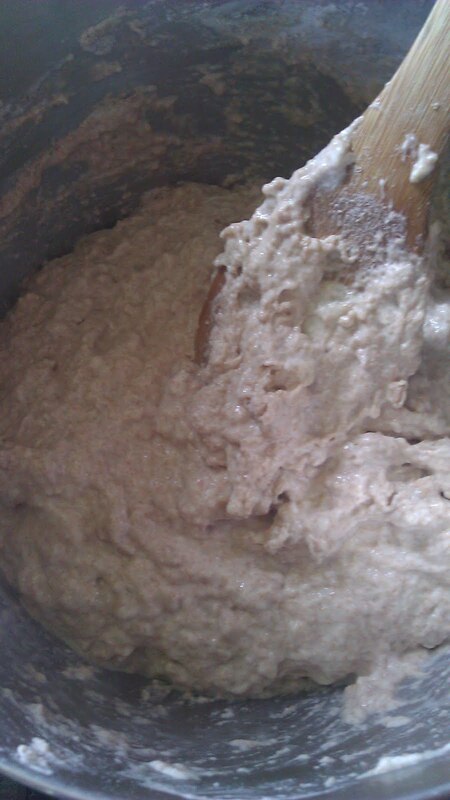 When you open the lid, the dough will look something like this...spongy & wet. That is perfect! Heat your oven to 450 degrees. Have your uncovered pot in the oven, as well as a deep cookie sheet (this will hold water. Use metal, not ceramic...Ceramic or stone will crack). Sprinkle a little flour over the top and begin to lift it from the edges with a big spoon. Keep sprinkling flour until you have a ball in your plate. Do NOT mix. You are just trying to get it from the bowl. When your oven is at 450, pull out the pot enough that you PLOP your dough in. Here is a tip: Make sure your cast iron is always seasoned. This way, the dough will not stick to the pan. No oiling necessary. Quickly put one cup of water in your cookie sheet below your put and CLOSE THE OVEN FAST. I do all this in a mere few seconds. I have my cup of water ready. The water creates steam, and you want to lock it all in with the heat as fast as possible. Take out of the pot and put on a cooling rack, or your burner, like I do :). You should wait at least an hour before cutting, if you can. If you cut it if it still warm, it is very soft inside. With that said, we can never wait an hour and cut it anyways :). This bread holds well for a few days, you just want to keep the cut side covered. I do not put it in anything, I just leave it sitting on the cutting board, with the cut side down, and a knife...ready for cutting any time :). If the bread does dry out, it is excellent for bread crumbs. Kitchen Witch Commentary: (Delphine) "It took a lot of hard work and persuading to get my Witch to try this bread. Now she makes it in her sleep, and I can just savour the wonderful aroma of witchy bread." My neighbor recently gifted me two Gugelhopf, or bundt pans :). One is metal, and the other a beautiful blue & white ceramic. My Oma used to make yummy yeasty breads & cakes, so I never had a need to make them myself. All these years, I have not attempted to make a Napfkuchen (that is what we called the Gugelhopf), or any of the wonderful creations I remember from my childhood. My neighbor has opened a flood gate :). First on my list is of course, the Gugelhopf, as I am in love with the blue ceramic and just want to make something in it. A little history from Wiki: Gugelhupf is a big cake, derived from the Groninger Poffert, and has a distinctive ring shape or the shape of a torus. It is usually eaten with coffee, at coffee breaks. Gugelhupf consists of a soft yeast dough which contains raisins, almonds and Kirschwasser cherry brandy. Some also contain candied fruits and nuts. Some regional varieties (Czech, Hungarian and Slovenian) are also filled, often with a layer of sweetened ground poppy seeds. It is baked in a special circular pan with a central tube, originally made of enamelled pottery. Similar pans are used for making Bundt cakes, a cake baking pan shape in the US derived from the Gugelhupf. I have some wonderful recipes from my Oma, but I picked one that is already translated & converted for the sake of sanity, and for instant gratification. Heat milk with 6 tablespoons butter and granulated sugar over low heat, stirring, until mixture is warm (105 to 115°F), butter is melted, and sugar is dissolved. Butter kugelhopf mold with remaining tablespoon butter. Put 1 almond in each depression in bottom of mold (the almonds are only decorative; you can skip them altogether if your mold has no depressions), then scrape spoonfuls of dough evenly into mold (dough will be very elastic). Cover top of mold with oiled plastic wrap and a kitchen towel and let dough rise in a warm place until it fills pan, about 2 hours. Remove towel from kugelhopf and gently peel off plastic wrap. Bake kugelhopf in middle of oven 15 minutes, then loosely cover mold with foil and continue to bake until golden and a tester inserted in center comes out clean, 20 to 25 minutes more. Cool in pan 2 minutes, then invert cake onto a rack to cool completely, about 1 hour. Dust with confectioners sugar. I eliminated the raisins because my daughter does not like them, but next time around I will add them back in. It just tastes a bit boring without them. My vanilla brandy was yummy here, but I am buying some Kirschwasser (cherry shnaps) for the next one. This always tastes yummy fresh, but makes a heavenly dip in for coffee on the next day! If you're laying an egg, I am too!! Today, one of our chickens was extra bitchy. She was gackering & feisty all day, wouldn't let us pick her up and move her, and she kept pecking on her loyal friend, Snowball. Some time during the afternoon, I was Skyping with my Mama in Germany, when Pepper jumped up on the dresser on the porch and started pecking on the window. "How strange" I thought, they never come in until it gets dark. So my son got the chickens, and put them in their makeshift coop. Pepper immediately went to the back and sat in the wood shavings instead of the roost. Then she began covering herself with shavings....while the other chicken started picking them right back off :). This was quite entertaining (I need a life! ), and got even better when Snowball turned around and SAT on her and began gackering herself. That's when Pepper drew the line and pecked "Get the hell off, sister!". My son kept checking on them, he was hoping for his first egg. She was acting weird, and it is about time for them to start laying. All of sudden I heard a PLOP. No, I thought. Then I hear: "MAMA, PEPPER LAID AN EGG!!!" My son carried his egg around, called his daddy, emailed his 4H project leader, and told all the neighbors. It was like a birth :). 4 hours later I was outside taking down clothes, when my son come careening out with an egg in his hand...."MAMA, SNOWBALL LAID ONE TOO!" That's my chicken, she was not going to be outdone. World: We have two layers.